PICMI has you covered. We find and onboard the best seasonal workers for your business. We take care of the admin so you can take care of the orchard. Let us verify and onboard your staff for you. Say goodbye to repetitive tasks. Spend less time in the office and more time where it’s needed. Get workers fastSave time and money, no more endless searching and repetitive admin. Pre-verified workersWe pre-authenticate workers, and provide details on experience and rating, so you can hire with confidence. 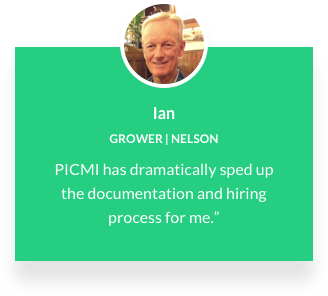 Why our customers love PICMI. Hiring short-term workers just got easier. Try PICMI for your orchard or farm today. Are you a worker looking for short-term job opportunities? Learn about PICMI for Workers.